It is important boundaries are reset and documented between the roles and responsibilities of the Board and management. As a result of Section 211 of the 2016 Companies Act1, it is important boundaries are reset and documented between the roles and responsibilities of the Board and management. 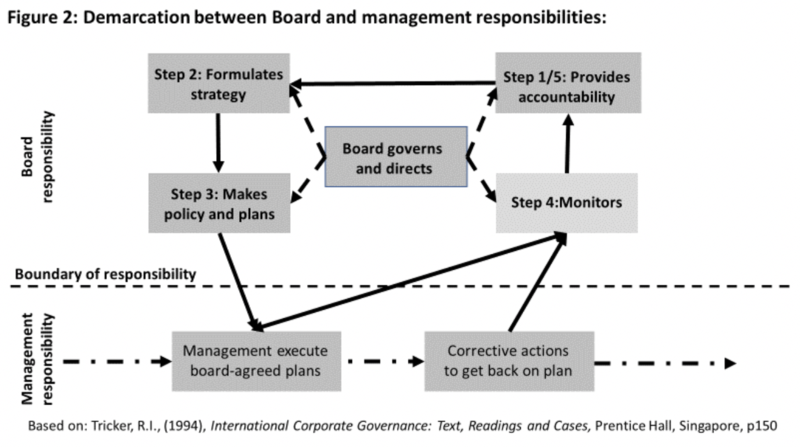 This is done in three parts: first, by the Board formulating strategy and providing accountability; second by achieving strategic alignment with the Board-determined Mission and Vision through the setting of strategy; third; defining clear boundaries of responsibility for directors and management, with appropriate supporting documentation in the Board Charter. 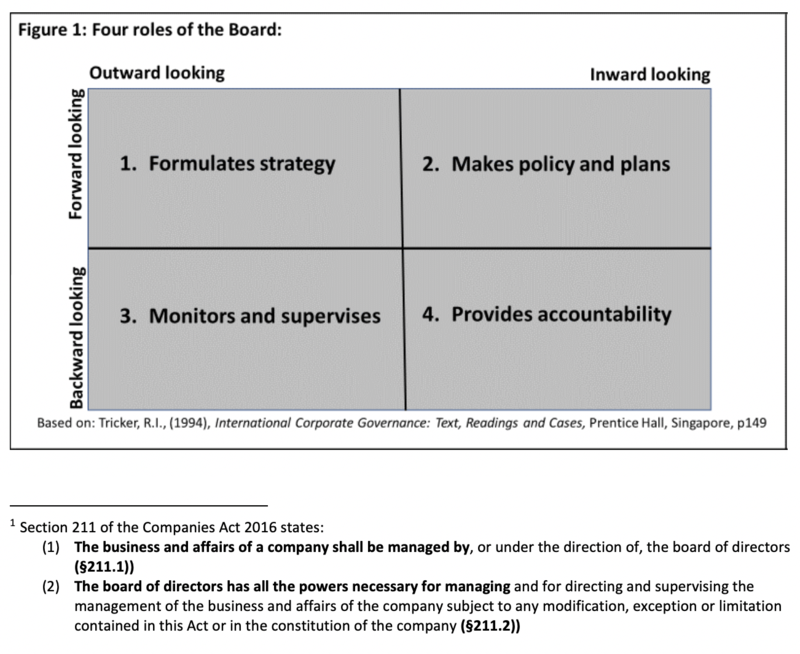 Boxes 1 and 2 and are forward and outward looking, reflecting the role that boards ‘govern and direct’, boxes 3 and 4 are backward and inward looking, reflecting the role that boards oversee management and are held accountable for whatever happens on their watch. Report results to the board. The failures of Enron in 2001 and WorldCom, Global Crossing, Tyco and Adelphia in 2002 in the US were the drivers of increasingly intense scrutiny of the board and its internal audit processes, as well as the role of external auditors, leading to the passage of the Sarbanes-Oxley Act in 2002iii. Review the adequacy of systems to comply with all applicable laws and regulations. Duty to manage or supervise management 102 (1) Subject to any unanimous shareholder agreement, the directors shall manage, or supervise the management of, the business and affairs of a corporation. The business and affairs of a company must be managed by, or under the direction or supervision of, the board of the company. 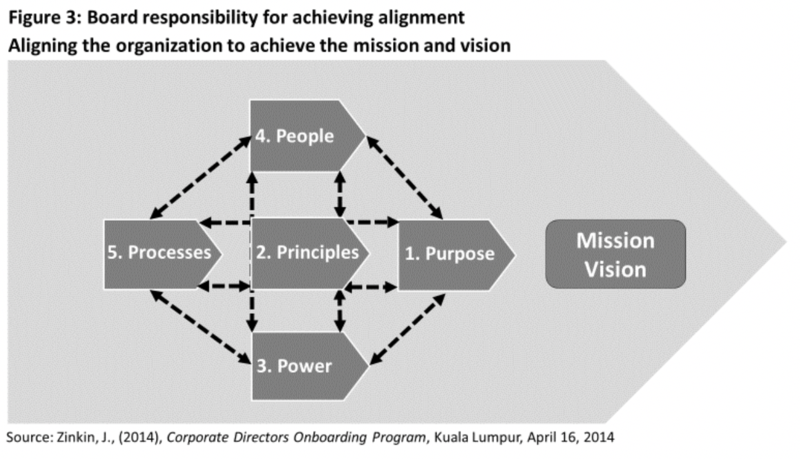 Figure 3 shows how the Board-defined Mission and Vision (essential elements of effective strategy formulation) will only be achieved if the organisation’s ‘Five P’s’ are aligned properly. If any one of the ‘Five P’s” is misaligned and does not point towards the Mission and Vision, the Mission and Vision will not be achieved. This is because the ‘Five P’s’ interact with each other, either reinforcing or weakening the organisation’s ability to set priorities appropriately and allocate resources accordingly. Working together, they determine and reinforce acceptable behaviour and Values. Working separately, they will create inconsistent behaviour and undermine the Values of the organisation. Lay down standards for ‘speaking truth to power. Apply the same transparent standards regardless of position and seniority. Ensure compliance mechanism is in place with confidential whistle-blowing procedures. Reviews the business plan and budget and sets targets for management. Report to the board on progress. Considers the risk factors in all major decisions. Implement ERM and COSO frameworks. Recommend remuneration to the board for key executives. Ensures adoption of and adherence to COSO framework. Supports management in handling key stakeholders. Ensure company obeys environment, safety and health laws and regulations. The crucial point is not whether the demarcation above is absolutely correct, but that it, or whatever demarcation the company decides upon, must be documented in the board charter and or memorandum and articles of association. If this is done, should directors ever have the misfortune to be hauled up in front of a judge, they can show they fulfilled their responsibilities, as laid down by their company’s constitution, making it clear where their responsibilities end and management’s begin. If they can demonstrate they fulfilled their responsibilities within these boundaries, they will likely be covered by the ‘business judgment rule’ and prove they have not been negligent or of acting in bad faith.